ODIS, the contextual web database for the study of 19th- and 20th- century intermediary structures, was created in 2000-2003 with a grant of the Flemish Fund for Scientific Research (FWO-Max Wildiers). Four major Flemish private heritage and research organisations with archival holdings combined their expertise: ADVN, Amsab-ISG, KADOC-KU Leuven and Liberaal Archief. In this joint venture they were supported by scientific promoters from the main Flemish universities (KU Leuven, University of Antwerp, Ghent University and VUB). In 2006 these partners structured their collaboration by founding the non-profit association (vzw) ODIS. The web database ODIS facilitates research on the history of civil society by offering a durable knowledge base where many different contextual data sets regarding these intermediary structures and their protagonists are being centralised and validated, together with elaborate information on their source materials and heritage. Researchers not only use ODIS as an encyclopaedia, offering them clear and reliable organisational and biographical information, but also appreciate its exhaustive references to archives, periodical publications and other (online) scholarly resources. The public resonance of the database is rapidly growing. In 2017 nearly 75.000 users consulted ODIS, leading to 628.308 registered record views. More and more cultural heritage institutions and scientific research teams make use of ODIS for data storage, representation and analysis. They jointly work in the same technical environment but choose their own focus and manage distinct data series in separate input groups or author teams. Facilitating processes of cross-fertilisation between very different communities, ODIS generates rewarding results, both improving the quality of historical research on intermediary structures and amplifying the resonance of their documentary heritage. Although the main data series of ODIS at present focus on the history of Flemish/Belgian civil society, the database also offers information on intermediary structures in other European countries and on international organisations. Several scholars acknowledged the unique functionalities of the instrument and urged the ODIS consortium to broaden its scope in order to meet the very different functional needs of research units that aim to study intermediary structures and their networks in an international comparative perspective. Answering this call, the ODIS database was thoroughly renewed and modernised over the past years. This venture was only possible thanks to a grant of the Flemish Hercules Foundation, a structural funding instrument for investments in research infrastructure. The new ODIS database still offers a reliable, flexible and user-friendly technical framework. But 'ODIS-2' clearly surpasses its predecessor by providing a broad range of new components and functionalities. Its scope has become thoroughly international. 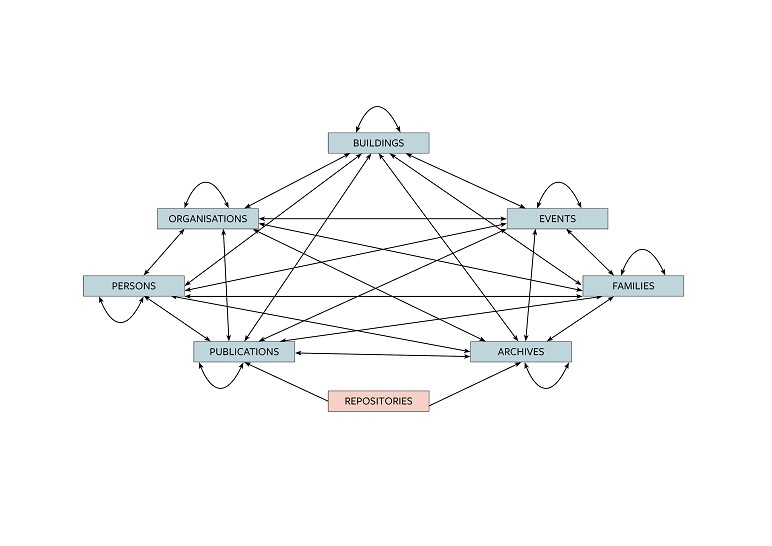 ODIS’ multilingual interface allows to construct interconnected data series, not only on organisations, persons, publications and archives, but also on families, buildings and events. Using international standards, ODIS provides many different vocabularies and thesauri, adapted to the historical context of the main West European countries. The new ODIS database not only facilitates in-depth analysis and spatial representation of its data series, but also positions itself as an information node, interconnecting many other online instruments that contain relevant historical information. ODIS combines the expertise of very different Flemish cultural heritage and research institutions. The non-profit organization (vzw) ODIS was set up on 10 October 2006.